Sound "The spacious sound of tubes with the clout and real-world drive of well-executed solid state"; "intimate detail and great articulation" along with "tonal accuracy and harmonic correctness." Features Similar to the circuitry in the Blue Circle BC2 amplifiers, but updated to deliver more power and fully balanced performance; custom power cord with ground-lift switch and BCC1.0 cones included. Use Accepts only balanced input; four chassis per stereo pair, so you'll need considerable floor or rack space. Value "Worth pursuing if you are in the market for truly revelatory amplifiers that demand (and certainly deserve) to be partnered with gear that will let them reach their full potential." Following up a successful amplifier design with a more ambitious and potentially more successful one would give most audio manufacturers a reason for pause. Not Blue Circle and its proprietor Gilbert Yeung. Hot on the heels of the BC8 mono amplifiers came the AG8000 monoblocks, which along with the AG3000 preamplifier form the core of Blue Circle's top-of-the-heap AG series. Blue Circle amplifiers have always offered unique technology in the realm of amplifier design and build, and the AG8000s are no exception. Drawing from the history of the highly regarded BC2 hybrid design structure, the new AG8000 is a return to this topology -- with a twist. Four, count em, FOUR chassis! Each of the AG8000 stereo channels, which altogether cost $14,500 USD per pair, has separate chassis for the respective power supply and amplifier circuitry. So you end up with four sizeable boxes -- 10.5"W x 9 1/2"H x 22"D -- finished in a very distinctive shade of blue. As with the companion AG3000 preamp, this color can be changed at the owner's discretion, as each set of amplifiers is made to order. Also unique is the addition of a hand-rubbed wooden faceplate made from a composite of walnut and purple heart wood. As with the matching AG3000 preamp, there is a slight bow to the fascia along with a recessed area for the now-familiar illuminated Blue Circle "blue circle" power indicator. The AG8000 uses a pair of Sovtek 6922 tubes for the pre-driver input stage along with a similar output stage to that of the BC8. But this is where the similarity to the BC8 ends. The power supply is totally re-worked, each gain stage having fully separate supply stages. The filtering on the power supply is a whopping 300,000 microfarads; again in typical Blue Circle tradition, this is a network of smaller capacitors, said to respond faster and not suffer the charge/discharge cycle that may plague a bank of larger capacitors under heavy load. Supplying the juice for this power supply is a pair of stacked 1250-watt custom-wound toroidal transformers, for a total of 2500 watts. I suspect that even under heavy loading situations, this supply wont run out of steam! As is now typical with all Blue Circle designs, the use of high-speed HEX-Fred rectifiers is here as well, both in the B+ and low-voltage power supplies. 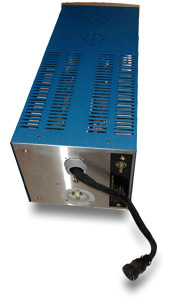 Specified output power is a conservative 150 watts into 8 ohms. Making the connection between the two chassis is a locking-collar DC power coupler rated for 34 amperes of power transfer. The supplied power cord is the same as that supplied with the AG3000 preamp in that it has a ground-lift switch right on the cord itself. The connection at the amplifier end is by means of an industrial-grade twist-and-lock 30-amp power connector. As with the AG3000, Blue Circle will custom terminate a power cord of your choice for a fee if you deem the supplied cord not quite your cup of tea. My own experience with the combination never left me questioning the power cord for a moment, and I suspect the ever-diligent Gilbert Yeung gave this some thought before implementing this particular customer-friendly arrangement. The AG8000 will only accept balanced input; there is no choice here as the AG8000 design was created from the ground up around a fully balanced circuit. Yeung felt it would be too big a compromise to include an additional single-ended input in the mix -- after all, we are talking about statement-level products here. Rounding out the features are pre-drilled BCC1.0 isolation cones -- three per chassis -- for support and isolation. These are attached by pre-mounted screws protruding from the bottom of the two chassis. Neat. For this review I used the AG8000s in conjunction with a Mark Levinson No.380, Aragon Aurum, and matching Blue Circle AG3000 preamps. The digital source was the Sonic Frontiers SFT-1 transport with a Mark Levinson No.360 DAC, connected by a Transparent Reference AES/EBU digital cable. Balanced Gryphon Guideline Mk 2 interconnects ran from the DAC to the Mark Levinson and Blue Circle preamps, or Transparent Ultra from the DAC to the single-ended Aragon Aurum. 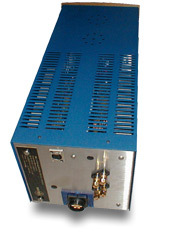 The interconnects from the preamps to power amps was Transparent Balanced Music Link Super. Speaker cables were biwire Transparent Music Wave Super. Speakers were B&W Nautilus 804s, and comparison amps were the Blue Circle BC8 monoblocks. The AG8000s sitting in a row at the end of my room, with their Blue Circle logos gently glowing, became an almost hypnotizing narcotic to take me into the very heart of the music. Sounds kind of out there, huh? Well, this was sort of the case. Listening to "Only Time" from Enyas A Day Without Rain [WEA 2 85986] proved to be a trip. Paired with the Levinson No.360 and No.380, the AG8000s had a vast and expansive presentation that displayed intimate detail and great articulation, despite the amount of processing on this disc. The hybrid design of this amplifier provides the spacious sound of tubes with the clout and real-world drive of well-executed solid state. The AG8000s' perspective is about as lively and open as a meadow on a sunny spring morning, but how about the other areas of these beasts' performance? Listening to Dave Brubecks timeless classic "Take Five" from Time Out [Columbia Legacy CK 65122] revealed the sax to be smoother, more open and focused than I had heard even with my BC8s. Bass was also tighter and "pluckier." Drums showed good dynamic flow, with a fine sense of the skins being evident. Certainly one of the more interesting aspects of the AG8000s performance was their ability to connect with the partnering B&W speakers and drive them like a well-tuned sports car. Big Krell amps have always had that "certain something" in the bottom end -- call it a vice-like tension, if you will. However, what the Krells possess in fortitude, Ive often found them lacking in musical grace. Not the AG8000s, which can control a speaker very well and yet easily shift gears and present a wonderfully textured, lush performance. A fine example of this is the title track from Janis Ians excellent Breaking Silence [Morgan Creek (Polygram) 314 519 614-2]. Ians voice starts subtly, and then all hell breaks loose. The AG8000s deftly tracked every curve on this track better than I could have imagined, with lots of definition and air apparent. Midrange presentation was excellent; the AG8000s did a fine job capturing the two distinct timing measures playing against each other on "Kathys Waltz," again from Time Out. Throughout this disc, I noted that the piano was reproduced with tonal accuracy and harmonic correctness. And the high frequencies were easily a match for the performance of the rest of the spectrum, exuding air, grace, and finesse. There was lots of detail evident in the upper ranges, yet they were never harsh or overly etched. Electronic compositions such as "Rain" from Suzanne Cianis Hotel Luna [Private Music 01005-82090-2] were incisive yet delicate at the same time, conveying the feeling of the piece's title rather succinctly. Remarkably, it was the AG8000s that pointed out the slight electronic glare that is present in the Mark Levinson No.380 preamp and brought me to the combination of the AG3000 with the AG8000. This combo made more than a strong case for itself, both in terms of resolving power and balance. I found myself positively mesmerized by this pairs ability to suspend disbelief and transport me closer to the heart of the music in ways that are often hard to quantify as being better in just one specific area. This was highly evident on Harry Connicks "Lets Call the Whole Thing Off" from the When Harry Met Sally soundtrack [Columbia CK-45319]. The piano timbre was excellent, with stand-up bass showing no overhang. The overall soundstage presentation was, without a doubt, the best I have heard in my home to date, with excellent front-to-back layering and ample soundstage width evident. So how do the AG8000s differ from the less pricey BC8s? The differences are probably evolutionary more than revolutionary. The BC8s are perhaps a more universal design, being able to accept both single-ended or balanced input. Also, the fully solid-state nature of the BC8s will yield a greater sense of comfort for some owners -- no concern over the tubes inside. There is also the matter of the cost differential; the AG8000s are over double the price of the BC8s. But compared sonically to the BC8s, which are my reference amps, the AG8000s develop a more robust and densely detailed bass region, leaving the BC8s sounding somewhat soft by comparison. Here was a classic case of the numbers failing to tell the whole story, as the BC8s offer more power than the AG8000s by a significant 75 watts each. But this difference in wattage translated to little in terms of absolute loudness in my system. Ultimately I found the AG8000s' dynamic ability to be more arresting than the BC8s'. "Fanfare for the Common Man" from the Wilson Audio Ultimate Reference CD [Top Music WA 8008] certainly displayed this facet quite nicely. The drums and tympani had far more snap, articulation, and weight via the AG8000s. The midrange is a closer call, which is surprising given the AG8000s hybrid circuitry. The nature of the sound is similar -- we are, after all, talking about two amplifier systems from the same family. The differences are more in terms of poise and shading, the AG8000 slightly excelling in these areas over the BC8, leaving the less expensive amp sounding perhaps a touch veiled and grainier in comparison. Instrumental timbres are also truer via the AG8000s. The opening sax on "Fee-Fi-Fo-Fun" from the Trio Frederic Alarie CD Live a Vienne [Fidelio FACD0002] bore this out fairly quickly, with the AG8000 presenting a more vivid yet natural account of the instrument without becoming harsh or aggressive. The treble also showed the superiority of the AG8000s, as it revealed more intricacies of tonal purity, shading, and the ever-so-valued "air up there" than that of the BC8s. I found the AG8000s superior in the realm of re-creating the sonic venue as well; images were more stable, and each instrument was more within its own space than with the already good BC8s. I wrote a companion sidebar to John Potis review of the BC8s that indicated I found the BC8s to be "blessed with one of the strongest set of virtues of any amplifier to have graced my system in a very long time." I still believe this. But to a greater degree, this statement holds true for the AG8000s, because the AG8000s build on the set of virtues established by the BC8s and elevates it to a higher level. Amplifiers in the realm of the audio universe inhabited by the Blue Circle AG8000s have to provide a level of performance worthy of their price of admission. The AG8000 monoblocks not only provide knockout performance, but they are also very unique products in an increasingly "me too" world. The AG8000s are definitely worth pursuing if you are in the market for truly revelatory amplifiers that demand (and certainly deserve) to be partnered with gear that will let them reach their full potential. At $14,500, the AG8000s are certainly far from being considered bargain products. Yet for those seeking something very special in a world populated with amplifiers routinely hitting five-figure price tags, the AG8000s make their mark. Price: $14,500 USD per pair.